You probably know how to throw a few ingredients in a bowl to make a healthy salad. But do you know how to make a healthy salad for weight loss? Many restaurant or homemade salads provide delicious flavor and smart nutrition but more calories than you need at mealtime. A diet-friendly salad, on the other hand, combines key ingredients to help curb hunger and boost your metabolism, but keeps calories in control so you see results on the scale. When you build a salad for weight loss, it's important to include ingredients that provide both protein and fiber. Protein foods help your body to build or maintain healthy muscle. Muscle tissue helps you burn more calories during the day, even when you're not exercising. If you participate in a strength training program, eating more protein will help your muscles develop faster so that you get a stronger, tighter body. Fiber-rich foods help you to stay satisfied after your meal so you eat less during the day. Foods with fiber provide bulk in your belly so you don't have the desire to eat. And if you consume foods with insoluble fiber, fewer calories from the food are digested. Healthy fat for satisfaction. It's easy to include fat in a salad. We all love creamy dressings with mayonnaise, fried toppings (like croutons), bacon bits, cheese, and other savory additions. They make salad taste good. But these foods with fat won't do much for your body. If you swap them for healthy fats, you'll get the flavor and satisfaction along with good nutrition for your body. If you include salad ingredients with protein and fiber, you help to keep your body in a state where weight loss is easier. But that's not all. If you fill your salad bowl full of these smart ingredients you displace other ingredients that can cause weight gain. That means there is no room for the high calorie, high fat additions that add pounds to the scale and inches to your waistline. Before you start to make a healthy salad for weight loss, you need to choose a base. There are so many different greens to choose from. If you're used to one type of salad green, don't be afraid to experiment with a new texture and flavor. 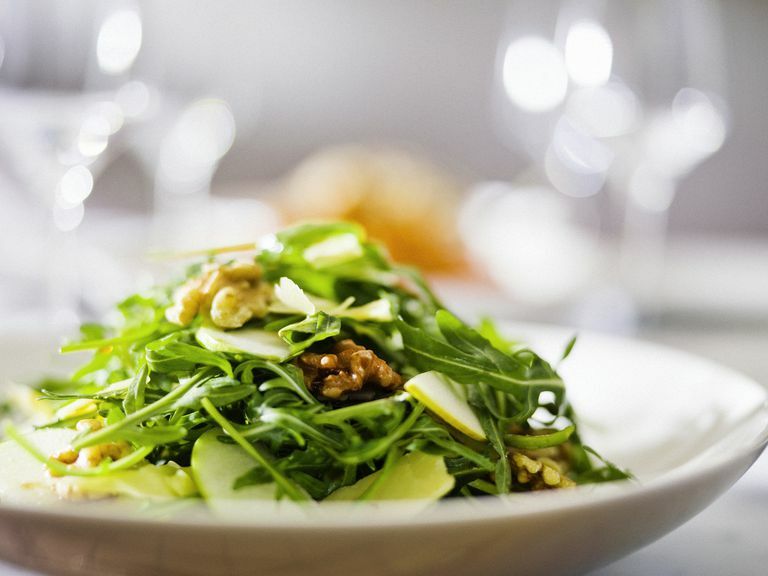 Softer greens like arugula, mache, or a spring mix (a blend of different greens) provide less crunch but more flavor. Crisp greens like romaine, iceberg lettuce, bibb lettuce, and cabbage provide plenty of crunch and texture. They are great for adding bulk to your salad. After you've got your bed of salad greens, choose a lean protein. Save time by cooking or preparing a large amount of your favorite protein source. Then divide the food into single serving containers that you can grab later in the week when you need to make a quick meal. If you're on the go and you don't have access to a refrigerator, you might not want to add meat or seafood to your salad. In that case, choose beans as your choice of protein. You can also grab a product like TopBit, a crunchy, savory, herb topping that adds flavor, crunch and ten grams of protein. Throw in fiber-rich vegetables (or even fruit!) to add color and crunch. Use these ingredients sparingly. In fact, it's smart to measure these ingredients because it's easy to overdo it. Finally, you can add a very small amount of a cheese or salad dressing, if you choose. But keep in mind that these will usually boost the calorie count substantially. So choose one or the other. For example, if you choose to add a small amount of cheese, then dress your salad with lemon and herbs instead of an oil or dairy-based dressing. If you skip the cheese (and croutons, bacon bits, and sunflower seeds!) then add salad dressing. But choose your dressing wisely. You'll find some yogurt-based dressings that are creamy and low in calories. You can also choose to make your own low-calorie creamy dressing or make your own vinaigrette. Homemade dressings are often lower in fat than store-bought varieties. Now that you've got your healthy meal in front of you, take a moment to plate your food and set a place at your dinner (or lunch) table. These simple steps help you to practice mindful eating. Dieters who take more time to taste, chew, and enjoy their food get more satisfaction from their meal and often eat less as a result.